I am fortunate that my family love to eat and love to drink. And even more fortunate that my children love fruit and vegetables, and drink plenty of water. In saying all of that, at this time of year, as germs and bugs fly around more during Winter I am always on the look out for ways to boost immune systems and provide much needed energy. The Breville Family Blend Active could not have arrived at a better time, we've had almost a month of bugs and infection circulating around our home, getting everyone back to full health- and maintaining health is a priority. And, fortunately, despite Mr J's usually reservations about gadgets filling the kitchen, has seen fit to give this pride of place on our worktop. Mr J loves the sports bottles, loves that they can be used whilst he cycles and plays squash, and the children in turn love their 'mini' versions. The Breville Blend Active is really easy to use which suits me down to the ground. The bottles come in 600ml and 300ml, the blend gadget fits on in place of the lid, fits into the main station and with 300w of power the blend is simple- and even slushes and ice-cold drinks can be prepared as (with liquid added to protect the blades) the Blend Active will also crush ice. The bottles are all secured with a superseal leak proof lid, which does cause the children difficulty in opening the bottle, but I'm happy to open their drinks rather than find the random spills around the place. The bottles themselves are impact and shatter resistant- which gets the big thumbs up from us, everyone is loving the sports look and the ergonomic design means they are definitely people friendly. What I love about the ease of use is how much the children can get involved in designing and creating their own drinks. 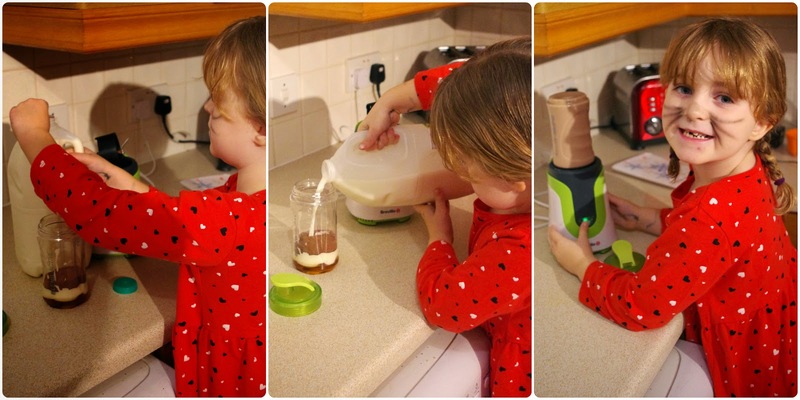 At 5 years old Seren is able to make a smoothie with the assistance of an adult, and because she chooses the ingredients and creates her drink, she then sees its hers to drink, share and finish. 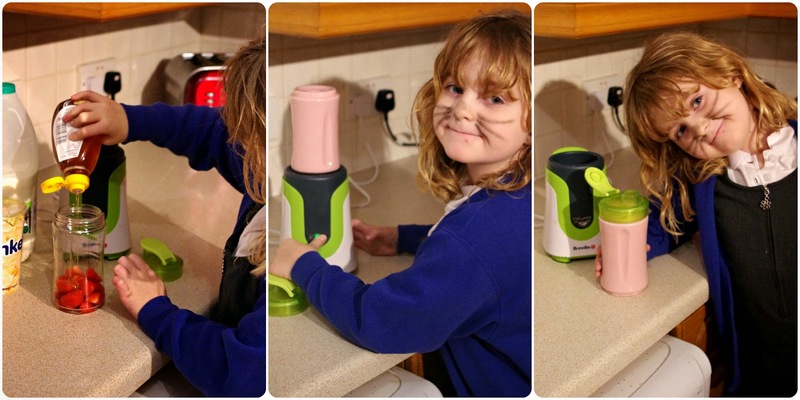 With Seren's smoothies I make sure the fruit we use are peeled or soft skin. Seren's favourite smoothies generally feature strawberries or raspberries, we use about 3 dessert spoons of yoghurt to thicken and top with milk. We've also added a generous squirt of honey, as at this time of year I am grateful of anything which might boost their health. The boys of the house have a far wider love of fruit, that or they find it hard to decide on favourites! With green fruit we use squash as a top up rather than dairy. And, whilst there's no doubt that the Blend Active is a really simple way to increase the fruits consumed by children- adding to those already a mainstay of their diet- it is also a great way to treat children as well, especially as you can engage their imagination! Seren's school concerts finished this week, and for being a completely amazing cat she was given the choice of what treat she'd like. So we substituted fruit with a few mini Wispa bits and chocolate milk powder. And whilst it was a treat for consuming, most of the excitement was in the preparation. And the cat definitely got the cream. We have definitely welcomed the Breville Blend Active into the kitchen and our lifestyle. It's great for adults and children to increase the fruit in daily life, which is something I definitely need. At a RRP of £40.00 it is mid-price point for smoothie makers- for me the extra benefit of this model is the efficiency of the drinks bottle, rather than creating extra washing up. And, of course, there are always bargains to be found with Breville currently retailing the blender for £29.99. We would definitely recommend this gadget to your kitchen! Disclosure: We received the Breville Blend Active Family Blender for the purpose of this review. All opinions and views contained are our own. Looks like a good product.